Sizes: 1", 1 1/2", 2", 3", 4"
All seals comply with FDA 21CFR177.2600. Max. pressure setting: 145psi, others upon request. 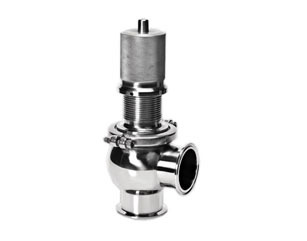 AV-9 series sanitary stainless steel safety valve, also known as "pressure relief valve", is used to control over pressurization in a process piping system. When the line pressure exceeds the limit set for the safety valve, the valve plug will lift and release the pressure through the side port. The valve will remain open until the line pressure decreases to a value lower than the set value. 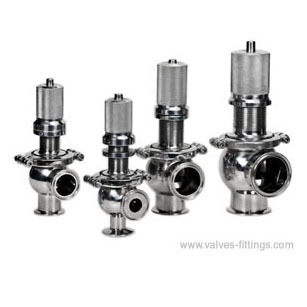 Adamant Valves is a trusted supplier of various sanitary valves. We offer high-quality sanitary safety pressure relief valves at a competitive price.